are or maybe just call them up and bother them! Or maybe even board them! I have no idea how many photos there are going to be. 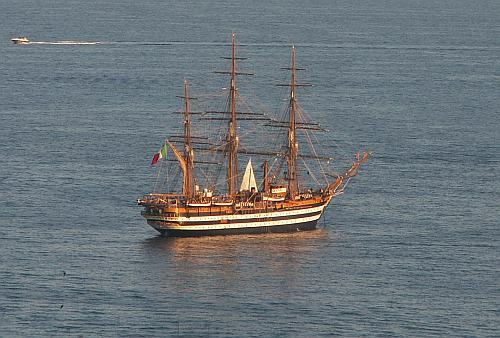 The Amerigo Vespucci, one of the two 'sails training vessels' used by the Italian navy. She was launched in 1931 to be the sister ship of the earlier Cristoforo Colombo (no longer in existence, but click here). Both were inspired by the style of large early 19th-century 74-cannon ships of the line. The vessel is a full-rigged three-masted steel hull, 82.4 m (270.34 ft) long, with an overall length of 101 m (331 ft) including the bowsprit and a maximum width of 15.5 m (51 ft). 26 Sails, 1,360 m2 (14,600 sq ft). Engine, FIAT B 308 ESS. 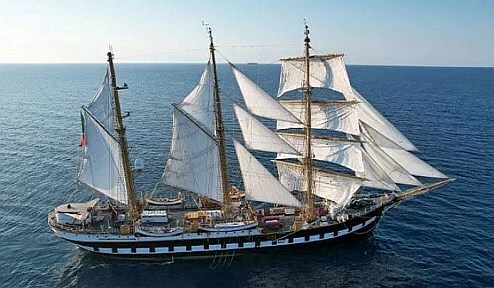 The Palinuro, the other 'tall ship,' training vessel, is a 3-masted, iron-hulled barquentine. The ship was built at the shipyard Anciens Chantiers Dubigeon in Nantes (France) and launched in 1934. In 1951 the Italian Navy, looking for a replacement for the Cristoforo Colombo, bought the vessel and renamed her Palinuro. General characteristics of the Palinuro: 858 gross tons; overall length, 69 meters; beam, 10 m; sail plan, Barquentine rig, 15 sails. 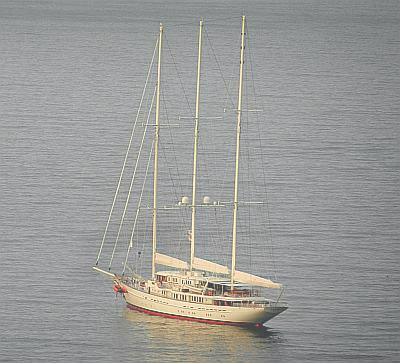 The Athena is a clipper-bowed three-masted gaff-rigged schooner built in 2004 by Royal Huisman (in the Netherlands). 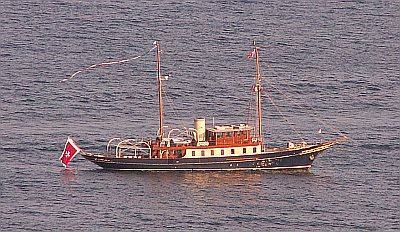 The Athena was built to order by the current owner, James H. Clark, American Internet entrepreneur. In July 2012 the Athena was listed for sale with an asking price of $95 million USD, but there is a much cheaper 204-page coffee table book called Athena – A Classic Schooner For Modern Times. Launched in 2004; Overall length, 90 meters (295+ feet); Beam: 12.20 m. (40+feet); Gross Tonnage, 1103; IMO: 1007237; MMSI: 319012000; Call Sign: ZCNP; Flag: Cayman Islands. Depending on whether or not you measure the bowsprit, Athena is possibly the world's longest private sailing yacht. The Eos, built by Lürssen in Bremen. Launched in 2006. Property of media enterpreneur. Barry Diller. Overall length: 305 feet (92.9m). Naval architecture, Langan Design. 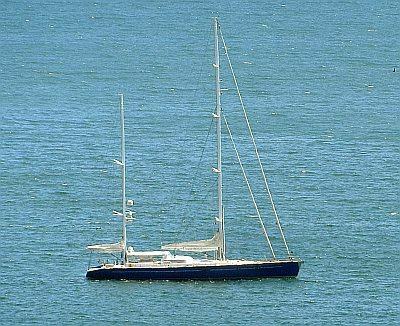 The Eos is another contender for longest private sailing vessel. Other stats: beam (i.e. the ship's breadth at its widest point), 44.29 ft (13.50 m); propulsion, twin screw with 2 × 2,333 hp (1,740 kW) MTU diesel engines; speed, 16 knots (30 km/h) IMO : 9377456 -MMSI: 319087000 -Call Sign: ZCPM3-Gross Tonnage: 1517 t., Flag: Cayman Islands. 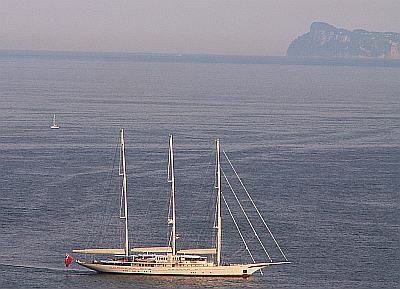 Also see this link for an entry and photo of both these vessels docked together at Mergellina. The Maltese Falcon is a so-called "Dynaship"--the automatic sailing ship of the future, with carbon-fiber masts and self-furling sails stored within the masts. The vessel is 88 m (289 ft.) long. I first mention this vessel here. The ship was formerly owned by American venture capitalist Tom Perkins and was sold in 2009 to Greek godzillionairess, Elena Ambrosiadou. 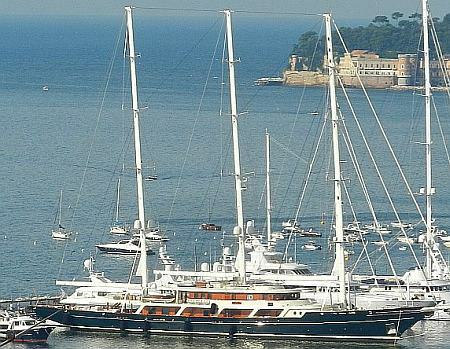 The Maltese Falcon was built by Perini Navi yards in Viareggio, Italy, and Istanbul, Turkey. Launched in 2006. It is one of the largest privately owned sailing yachts in the world at 88 m (289 ft). The dynaship concept is a 1960s invention of the German hydraulics engineer Wilhelm Prölss, which was intended to operate commercial freight sailing ships with as few crew as possible. The ship has fifteen square sails (five per mast), stored inside the mast; they can fully unfurl into tracks along the yards in six minutes. The three carbon fiber masts are free-standing and able to rotate. Port of registry: Malta. 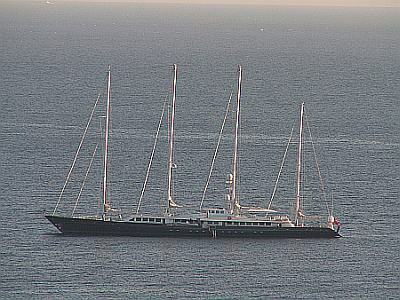 Displacement, 1,240 t; Propulsion: 2 × Deutz TBD 620; Sail plan: full-rigged ship; Sail area 2,400 m2 (25,833 sq ft); IMO number 9384552 and MMSI 249555000. Call sign 9HUQ9. 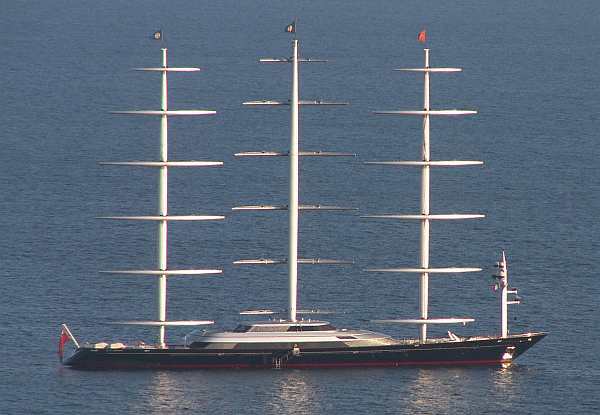 At the link where I first mention the Maltese Falcon (directly above), I note the presence of what I called "either the world's ugliest mega-yacht or the coolest Bond-villian yacht ever." 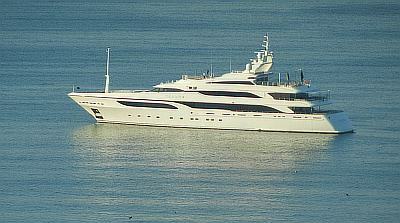 Here is the motor yacht 'A' owned by Russian billionaire Andrey Melnichenko. (That's right, just "A" for Andrey and, maybe, Alexandra, the skipper's Serbian wife.). Stats: length: 390 feet (119 meters! ); launched in 2008; built by Blohm & Voss, Germany. 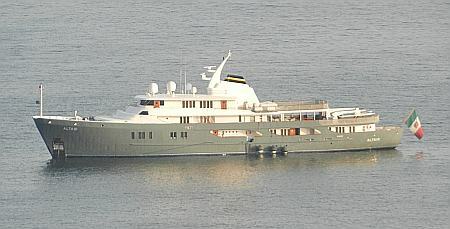 The "A" carries a crew of 42, has three swimming pools, a helipad and three 30-foot speedboats. The ship was designed by French product designer Phillipe Stark and is totally enclosed. Port of registry: Hamilton, Bermuda; launched: January 2008; displacement: 5,959 tonnes; Installed power: 9,000 kW (12,000 hp); propulsion: 2 × MAN RK280 diesel engines; speed: 23 knots (43 km/h; 26 mph); range: 6,500 NM (12,000 km; 7,500 mi). The Talitha. This beautiful classic motor yacht was built in 1929 at the Friedrich Krupp Germaniawerft in Kiel, Germany, for Russel A. Alger of the Packard Car Company. The vessel has passed through a number of owners, names, uses and refits in her 85-year history. 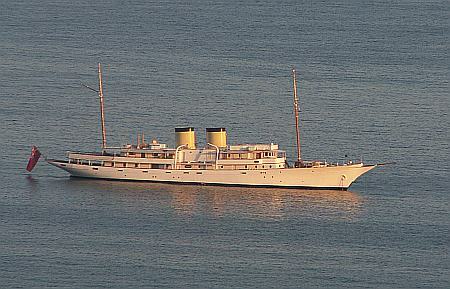 Owners have included J Paul Getty Junior, responsible for the current name of the vessel. Other names have been USS Beaumont, when she was used as a patrol gunboat by the US Navy during World War II. She was rebuilt in her entirety in 1994 at the Devenport shipyard (Plymouth, UK) and remains in use by the Getty family and for charters. Stats: overall length, 80.00m (262' 5"); Beam, 10.34m (33' 11"); engines: 2 Caterpillar 3516 TA 1; cruise speed, 13 knots; crew, 18; passengers, 12. Registered with IMO number 1004625 and MMSI 310051000. Call sign ZCAN7. Currently sailing under the flag of Bermuda. Royal Clipper is a steel-hulled five-masted fully rigged tall ship used as a cruise ship. She was designed by Zygmunt Choreń, for Star Clippers Ltd. of Sweden, and was built in 1990 using an existing steel hull that was modified by the Gdańsk Shipyard. The ship was designed as a sailing holiday cruiser for Polish coal miners. She was sold because of financial problems. The Merwede shipyard (Netherlands) completed the ship's interior in July 2000. The renovations included frescography murals by Rainer Maria Latzke completing the ships' Mediterranean interior. Her design was based on Preussen, a famous German five-masted Flying P-Liner windjammer built in 1902. Star Clippers claims that Royal Clipper is the largest "true sailing ship" built since Preussen. 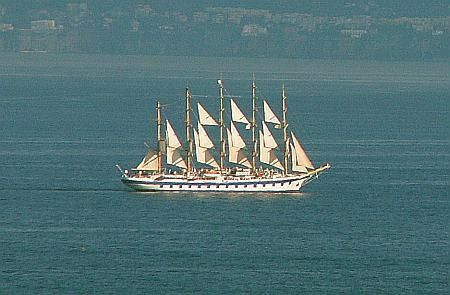 She is listed in Guinness World Records as the largest square-rigged ship in service, with 5202 square metres of sail. Her sails can be handled with a crew as small as twenty using powered controls. Port of registry, Malta; tonnage, 5,000 GT; length, 439 ft (134.8 m); beam, 54 ft (16.5 m); masts, 5 (3 of which are 'dyna rigged' (see Maltese Falcon, above); sails, 42; sail area, 56,000 ft² (5,202.6 m²); engines: 2 Caterpillar 3516 diesels; Capacity: 227 passengers; crew: 106. IMO: 8712178; MMSI: 215813000; Call Sign: 9HA2796. And I just like this photo from a recent miscellany page. The container ship is the Jennifer Rickmers. Go, Palinuro! The 59 metre Altair III was built by the Dutch Superyacht builder Amels in 1974 as a pilot vessel (the boat that transport pilots between land and the inbound or outbound ships.) It was transformed in 1996 into a luxury superyacht. Exterior and interior, were redesigned by Jon Bannenberg. Major refit in 2003 Cruising speed 7 knots; top speed of 13 knots. Here she is pictured cruising the Italian coastline. Length Overall (m) 59.00 (ft): 193; Beam (m): 10.80/(ft), 35. Guest Cabins: 1 Master, 1 VIP, 2 Double, 2 Twin; Guests: 12; Crew: 20. Paxman Engine. Model: RPH200 Mark 7. Number of Engines: 3; Type: Diesel-Electric; HP: 625; KW: 466. MMSI: 247092700; Call sign: IR8836 SYT#: Y00811 Flag: Italy. Flag: United Kingdom; Port of Registry: London. Length Overall, 39.00m/128 ft. 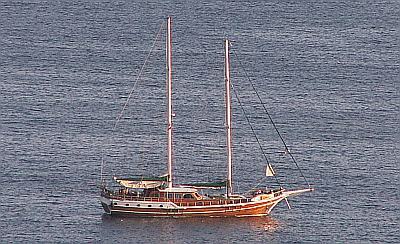 Built by shipyard: Bod-Yat A.S. in Bodrum, Turkey, year 2008. Yacht reviews stress the leisurely seafront home effect and praise the mysterious design: "...black livery of its aluminium hull, the dark wood of the deckhouse... sails in the colour of the night...the deckhouse has wide rectangular windows rather than portholes, with a 360-degree view from the salon and direct contact with the sea. 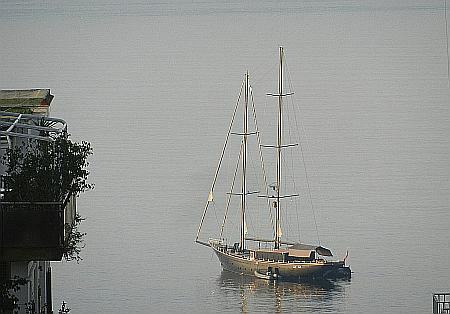 A ketch-rigged 32 m sailing yacht available, according to ads, for charters in Turkey and the Eastern Mediterranean. However, the vessel was in the Bay of Naples a few days ago (as of 12 July, 2014) and is now off the Amalfi Coast in the Bay of Salerno. 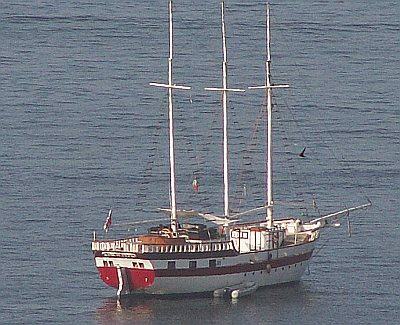 The 104ft /32m vessel was built in 1998 by Nedship and last refitted in 2005. 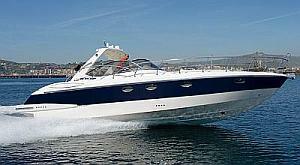 Can accommodate 6 guests in 2 double cabins and one twin. She has a full array of "water toys" such as wake boards and scuba and snorkeling gear. Further: beam, 8.10m/26' 6". Engines: one Cummins, 300HP; cruise Speed: 9 knots. Designer: Notika. Call sign MXTW9, MMSI 232673000, flag UK. And it's driving me crazy. Pseudo-galleon escaped from some Pirate Land Adventure Park. There must be a ship equivalent of facial recognition software. If you can identify this vessel. I will arrange to let you walk the plank and/or be keel-hauled aboard her -- two of the most thrilling adventures in all of Yo-Ho-Ho lore! I'll even throw in a bottle of rum. Yes, this little sweetheart is for sale, and it's so close to my house I could walk across the water and pick'er up for a charm (and if I could walk on water, money would be no problem). Promotional sales blurb: "At a magnificent 75.75m (249’) and 2242 GRT [gross register tonnage, a measure of the internal enclosed space of a vessel, not to be confused with such things as displacement], Ocean Victory was the largest Feadship ever built at the time of launching and remains the largest Feadship ever offered for sale. Totally custom-built in 2009 by the renowned De Vries Feadship shipyard." 7 cabins, Portuguese bridge (I don't know what that is)*, Alberto Pinto interior design, full beach club with gym, massage room, Hamam (I don't know what that is)** and Sauna, cinema for 12, six swimming pools, an internal floodable dock, which enables the internal boarding and loading of the yacht's 14m Riva yacht tender. Feadship, by the way, is a cooperative venture between two shipyards (Royal van Lent and Royal De Vries) and maritime engineering company De Voogt Naval Architects. Further from the promo lit: "Ocean Victory is truly one of the finest yachts of her size and type ever built. Maintained regardless of cost and only ever used privately, never chartered, she is a proven ocean-going vessel ready to go anywhere in the utmost comfort." Guests 14. Crew, 24. Construction: Steel + Aluminium; Engines: 2 Caterpillar (2,682HP); Stats: Length: 75.75m, Beam: 13.60m; built: 2009; Cruising speed: 14 Knots. *Well, ok. A "portuguese bridge" is a walkway behind the foredeck, in front and to the sides of the pilothouse windows, separated from the foredeck by a waist-high bulwark. ** OK, again. Hamam is the Turkish and Arabic word for what is usually termed a "Turkish bath" in English. A steam bath. *** I still don't know what that is, but scuttlebutt (HAR!) says $180 million USD. 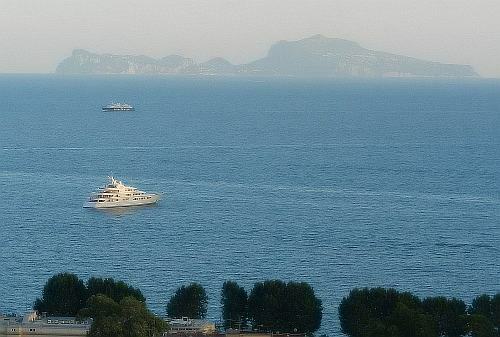 in the Bay of Naples. Sad story. See this link. 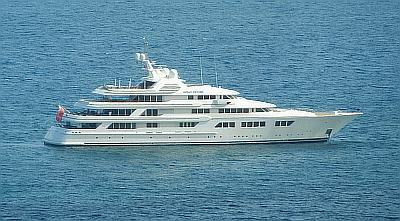 My yacht, Ocean Victory, 249 feet long. Imagine everyone in evening wear, black tie with champagne glasses eternally filled, mingling and taking the night air on the aft second deck as lights from the panorama that is Naples begin to twinkle on. The entrance to the formal salon for dining just behind them is an arc of deck-to-overhead glass through which may be seen serving staff in white livery placing crystal flutes of varying sizes and heights at each place setting. Beef Wellington with puff pastry embracing a fine Parisian paté is just the beginning of the three hour meal, and each seat at the table has a wonderful view of the glittering Bay of Napoli and its coastlines. I include this vessel because I have never seen it before, nor had I ever heard of the Gestur Campagnia Navigation company. They have been operating out of Pozzuoli since1994. They describe themselves as a minicruise company specializing in local ports of call in the Campania region of Italy, including Pozzuoli, the islands of Ischia, Procida and Capri and along the Sorrentine peninsula and around the cape into the Bay of Salerno. 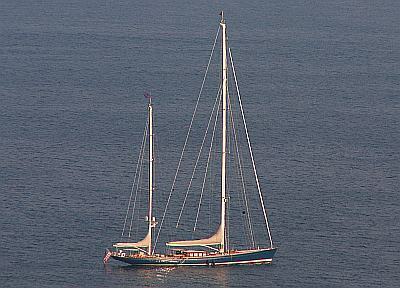 The company has three or four vessels, of which the Myriam is one. I don't know why it was moored off of via Caracciolo in Naples this morning unless it had been chartered and was taking on passengers by tender. Some of the large vessels take a few cars. This one does not appear to. 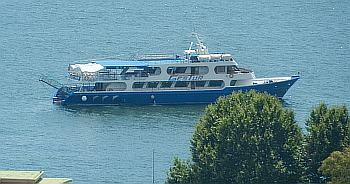 She is 50 meters long, beam 10 m. and can hold 400 passengers. It sells itself as more than just a passenger transport vessel; that is, large room for dining and dancing, sun-roof, swimming platform at the stern, and in the strange English of those who are too lazy to ask, "...4 toilets, appropriate for dancing nights, with sophisticated hi fi system." Engines, 2 x 4,522hp Caterpillar; carries a 7m Novurania Chase tender with 230hp engine, an 8.5m Stancraft 350 HP custom wooden tender, a 6 m Ribeye tender with 115hp outboard, 2 x Yamaha VX 1100cc Jet Skis (3 man), 2 canoes, 2 paddle boards, waterskis, wakeboards, an Aqua park trampoline, snorkelling and fishing gear, and every imaginable electronic communication gizmo and toy such as Wi-Fi internet, VSAT, satellite TV, etc. IMO 1011501; MMSI 235088016; UK flag; callsign 2ETL3. Let's not forget these folks--working fishermen, of whom there are still a great many. The small boats are now crowded by pleasure craft at the harbors in Naples, but they have been around for a long time and there is something reassuring about their slow, timeless presence. updates 2015 here, here and here. Small 2016 updates here and here. 2017 here. 2018 here. 2019 here.